An enthusiastic community filled the seats of the Constantine Theatre in Pawhuska to relish Dance Maker Academy’s performance of The Nutcracker. An all-student cast graced the stage, including 22-year-old Amity Bevard. 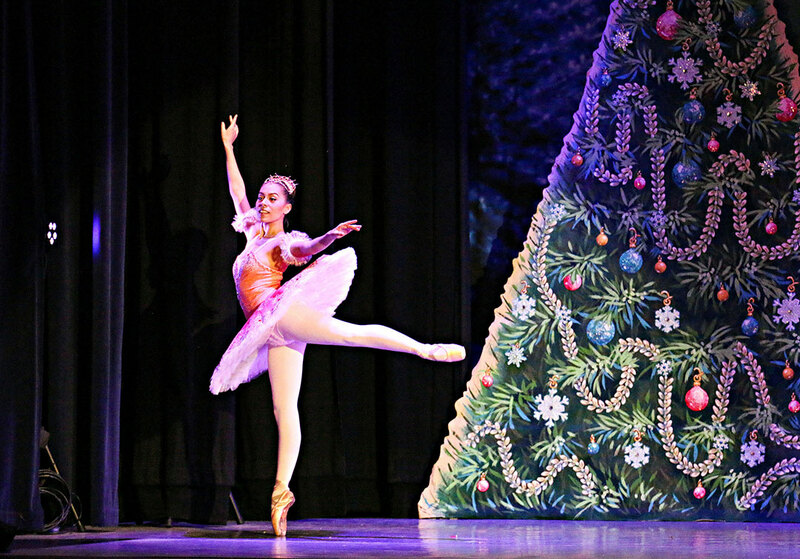 Bevard, Osage, danced as the Sugar Plum Fairy in the production. She said she shares a special connection with another Osage dancer. In 1954, America’s first Prima Ballerina, Maria Tallchief, performed as the New York City Ballet’s first Sugar Plum Fairy in George Balanchine’s The Nutcracker. Bevard grew up in Yukon, Okla., part of the metropolitan area of Oklahoma City. She began ballet at the age of six at the Doran-Vossen School of Dance. An aunt that desired to see her posture improve sponsored her training. “My aunt Peggy Cunningham wanted to see me stand tall and properly and not slouch,” she said. According to Bevard, the Doran-Vossen School of Dance was specific to technique, in which she learned most of her current foundational abilities. “My dance instructor at Doran-Vossen, Debra, gave me my love for ballet … she was maternal and nurturing beyond just a dance instructor,” she said. So much so, the ballet studio felt like a second home. At 18, she and her instructor heard about the auditions for Wahzhazhe: An Osage Ballet in Pawhuska. Being Osage, Bevard was encouraged by her instructor and inspired by her ancestry to audition. She was selected and given the opportunity to dance as an apprentice in the production in 2013 at the Bartlesville Community Center. She began to transition from student to teacher at this time, she said. In 2014, she danced at the Skiatook High School Auditorium and the Tulsa Performing Arts Center. She moved from apprentice to main company into her first professional ballet role. Later that year, she performed Wahzhazhe at the Miami Theatre. Venturing outside of Oklahoma, Bevard danced this story of the Osage people on the Benjamin Franklin Parkway at the Festival of Families 2015 in Philadelphia. This performance was not only graced by Pope Francis but also broadcast to millions. After Philadelphia, Bevard was able to perform in Santa Fe at the Lensic Performing Arts Center and again later at Rolla Public Schools in Missouri. Wahzhazhe ballet Director Randy Tinker-Smith had much to say about Bevard. "Amity is a great teacher at Dance Maker Academy. We teach a lot of Osage children and because she is Osage and understands our culture, she is able to communicate with them in a way that helps them express themselves within our culture,” she said. “She has a quiet elegance about her that is a great example to our students while they learn the art of dance." She also expressed how unique the opportunity was for her to dance as the Sugar Plum Fairy. “Maria Tallchief and I have a special connection through that role, both being Osage and sharing a love for this discipline,” she said. “Having the opportunity to perform that role is not given to many people. She was the first Balanchine Sugar Plum Fairy for the Nutcracker for the New York City Ballet.